Chop the chicken slices into small pieces and add to a bowl. Take the rest of the ingredients and add to the bowl and mix together. Take the wraps and slice the top off, gently splitting them apart to make pockets. Stuff them with the chicken salad mixture and serve. 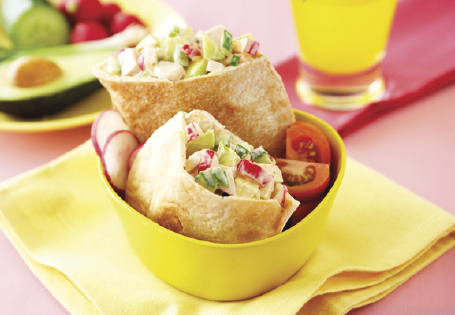 Tip: *You can substitute chicken slices for leftover roast chicken and shred into the salad mixture.